M.C. 's dog greeted my wife and I at the door to his house, enthusiastically as only a happy dog can. Once our wives had left for a day out, M.C. 's dog had calmed down, but M.C. 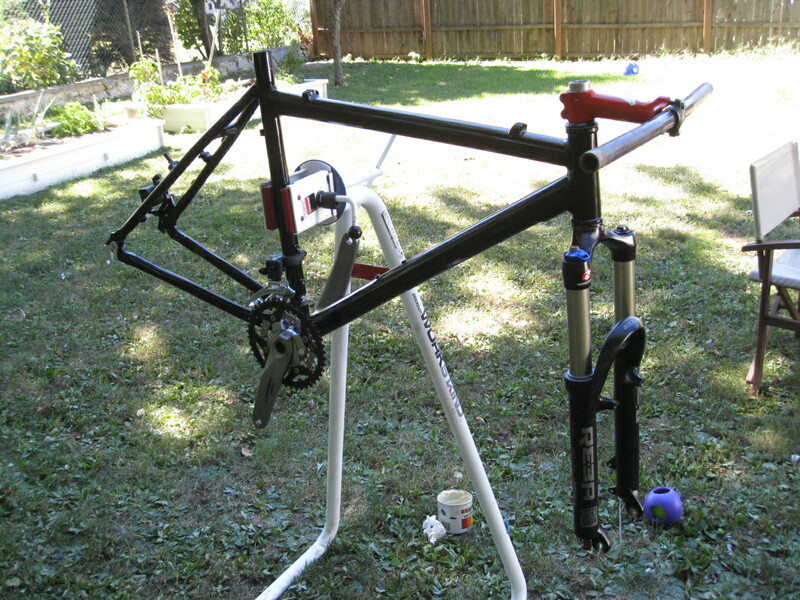 himself could hardly wait to set the bike up on his workstand in his backyard. To my relief, he was happy to see how I had installed the crankset, but his face fell a little when I told him that we wouldn't be finishing the bike that day. I had brought the Cane Creek threadless headset because I knew we'd be installing the fork, but I had left the wheels and other components home; determined to stretch this build out as long as possible. M.C. showed me the parts he wanted to sell me, and I was convinced the value could not be greater: the Reba Race fork looked pretty serious and the rear derailleur was in great shape. As M.C. explained, he upgraded the fork for his own mountain bike and wanted a red rear derailleur instead of a black one. Black was becoming a theme on this bike, so I didn't mind. The small, six-sided box in the above picture contained the Cane Creek S-3 Headset I had bought online, and that would be the first thing to install. I brought it along with the pedals and other parts in the plastic tub, but since I wasn't sure I'd end up wanting the handlebar M.C. had, we didn't install those parts. The headset was the first priority, and M.C. excused himself to head down into his basement workshop so he could get the proper tools. When he came up again holding something I wasn't expecting, he gave me an explanation. "Bike shops use this big metal thing with a handle and a screw and a clamp and you twist it around to install a headset. I just use a croquet mallet." So M.C. 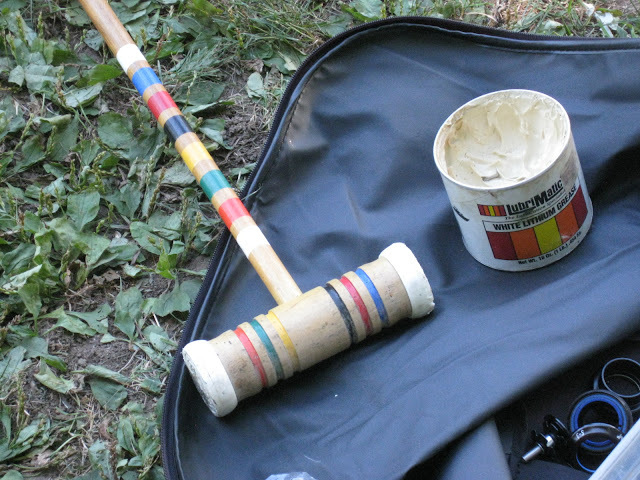 and I took turns John Henry-ing the headset into place with the croquet mallet. And once the inside of the tube had a proper amount of grease, we put on the fork. With me holding it in place he slid a red, Specialized stem into place (with the proper number of spacers so it could all be tightened right). Since I was sure I wouldn't want my handlebars to be very low, it would only serve as a placeholder, but having a fork was a huge step and I could also figure out what I needed in the way of cables. You'll notice the top tube of the frame in the picture above has three openings: one for the rear brake and one each for the front and rear derailluer. So I put the frame into the enormous bike transport bag I carried everything in and we set off to the Wallingford Bike & Repair Shop. I wish I remembered the name of the person who helped us out so I could give proper credit where credit is due, but he pulled the frame out of the bag, measured all the cables I needed and clipped out the exact lenghts I needed for the project. 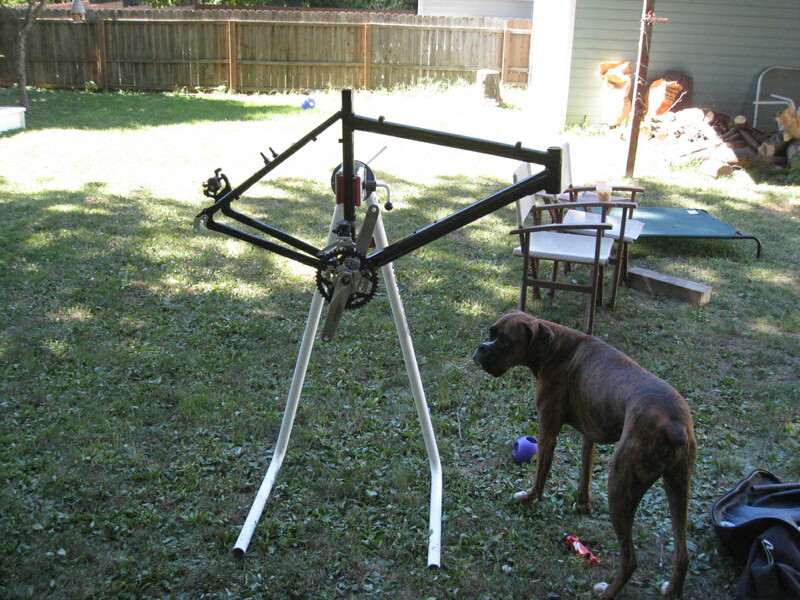 I also bought a seatpost collar from the Wallingford Bike & Repair shop. I knew I could have saved a little money if I bought one online, but when I spend money at an independent business, I know where that money goes: the guy didn't have to cut the cables to the right lenghts for me but he did. M.C. and I headed back to his house and soon stood back to admire what we had done. It wasn't over. M.C. 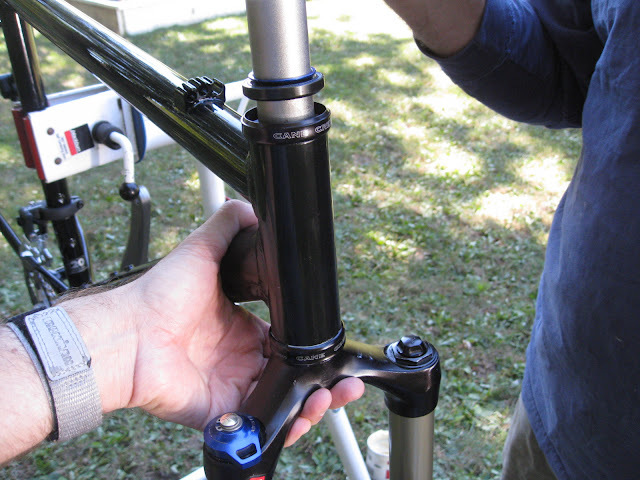 explained to me how the Reba Race shock worked, and explained that I could pump air into it to adjust the suspension. That was something that never occurred to me. "I'm going to give you a shock pump," said M.C. "I don't even know what that is," I said. "That's why you need one." And that was it. 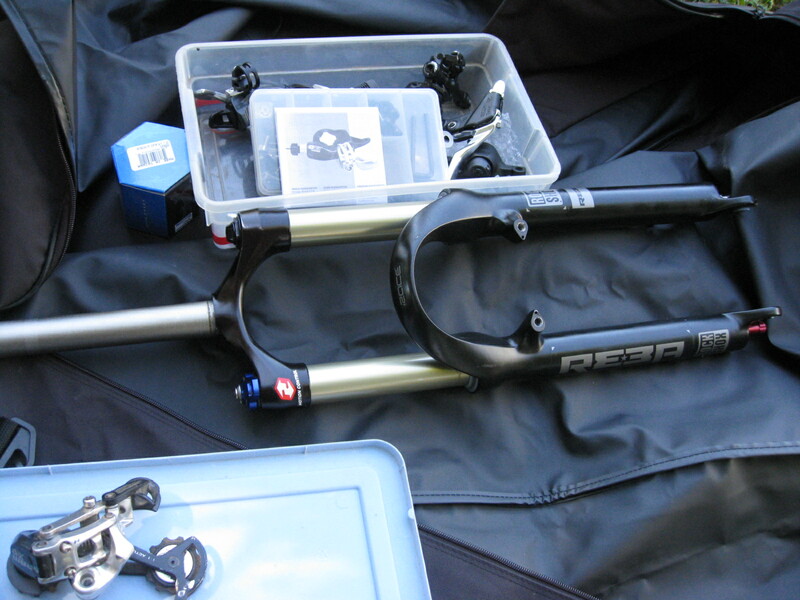 I later put the shock pump and everything else into the big Nashbar bag and carried it to the car, many steps closer to a finished mountain bike than I had been that morning. Beautiful Architecture and great instructional pics.